papery mash: What's up Sadie? Good Saturday morning to everyone in craftland - hope you are all well! In my pile of "photos to be scrapped", I found these b&w supercute pics of a 2 year old Sadie. She's clearly fed up with me clicking the camera at her and wants up for a hug instead. That pic of her puckering up for a kiss is just adorable. When I first looked at them I thought I would definetly do a monochromatic layout for a change as these photos were just ideal, but I'm such an anti-authoritarian (I try to keep it in check mostly heehee) - I couldn't help but rebel against even my own rules! So instead of toning it down, I have ended up with a riot of colour and glitter thrown in for good measure too! A bit OTT? Probably. I wonder if this psychology works in reverse? Like, if I set myself a brief to make the most colourful layout known to mankind, will I end up doing a black and white one. Probably not! 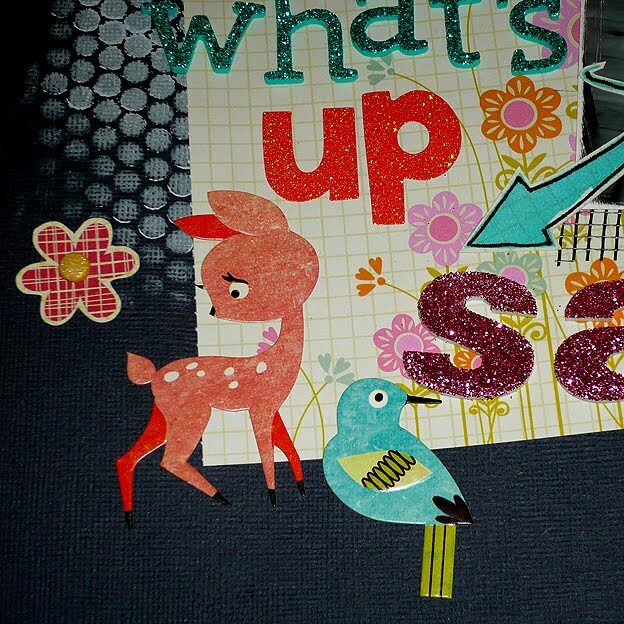 Anyhoo, for this LO I have used American Crafts textured cardstock as my base and I added some background texture by dabbing a white chalk ink through some sequin waste. 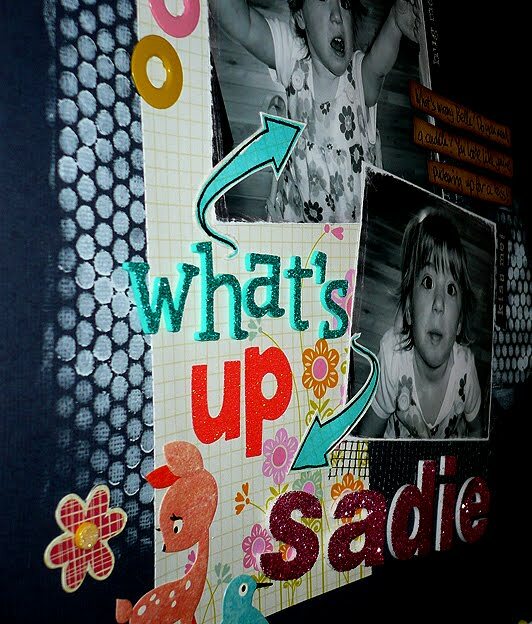 The photos were distressed at the edges by sanding with an emeryboard and layered on top of Colorbok patterened paper. Both the turqouise and orange alphas are from WRMKs kits (from TK's again, ages ago) but the pink foam ones are from Poundland (I love a scrapbooking bargain). My favourite tool of the moment is a rotary cutter I bought from The Works. I love the blade that does a perforated line which you can then rip, leaving a roughness to the edge of the cardstock. Righto - the washing machine has just stopped. Heyho, time to get that washing out and on with my domestic duties. I have a work related project to get stuck into later which entails a bit of sewing! Hopefully I'll be able to cope with this and not get into too much of a mess - you know how stressed sewing makes me! So, this is me. I made all the mess! Hello, I'm a busy mum of 2 girls and a magazine designer in my "real" life. 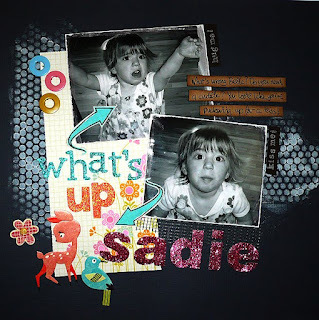 I love scrapbooking, cardmaking, making mini books and recycling/repurposing. Nothing is safe and is only ever a gluestick away from being stuck on one of my projects!! Long Time Since I Blogged!! Life Documenting: Dispatches from the Land of the Flu (and Haunted Urethra).